Written by Guest post on Wednesday, 08 November 2017. 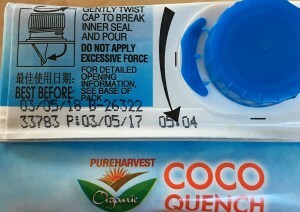 So your UHT Coconut Milk says Best Before 03/05/18 but what about after you’ve opened it? Do you know? Have you looked? Many products have excellent and detailed After Opening instructions but how many of us read them? If you take a look at what’s in your fridge or in your pantry, you may be surprised to see that many products have After Opening instructions. I think most of us are familiar with the notion of “Refrigerate after opening” but many products have shelf life limits and warnings. For instance, you’ll see “Use within 3 days of opening” Or “Use within 30 days of opening” and so on. Which products have these warnings? Many products from vegetable juice to cook-in sauces, curry bases and condiments have After Opening instructions. This is not a universally applied, or even a consistently applied phenomenon, as far as I can judge. Some mustards like Maille, say “Refrigerate after opening” while Masterfoods mustards don’t. I’ve found pickled onions that are to be refrigerated and eaten within 3 weeks of opening and others with no After Opening expiry. Many yoghurts state that the contents should be consumed within a particular time frame but that time frame isn’t consistent from brand to brand either! There are no official food rules for this as there are with Use-by or Best-before dates which must explain this huge variation. Here are a some examples. Take a look at the coconut yoghurt on the top left. It says it needs to be consumed within 5 days while the dairy yoghurt next to it has to be eaten within 3 days after opening. Many foods have quite short shelf lives after opening and many of us aren’t aware of such limits. Some dips have to be consumed within a day, others 3 days. Some smoked salmon and trout state that they should be eaten within 48 hours of opening. UHT coconut milk within 3 days yet wild, fermented sauerkraut can be kept for 3 months after opening. Quite a difference! Have a look at your stored foods and check the After Opening instructions, it pays to be food safe!I’ve seen open bottles of tomato, barbecue, soy and other sauces stored in cupboards or on breakfast bars yet most of them state they need to be refrigerated after opening. When you’re out shopping do the same. Why buy a product that is going to expire in two weeks after you’ve opened it when another has no after opening expiry and just requires refrigeration? It would be nice if all yoghurts and all sauces had the same instructions but at the moment they don’t and there often doesn’t seem to be a reason for the differences. Similar, if not identical, ingredients are present and yet the shelf life varies. Another case of Buyer Beware! Thank you to Munaiba Khan, a retired naturopath with an interest in nutrition for this post. Q. What's the difference between a Use-by and a Best-before date? Q. How come many of the cans in my cupboard have no use-by dates on them?